Hey all! So exciting day for the blog, first ever participation in a cover reveal, and I couldn’t be more excited to share this with you. The Underside of the Rainbow is the debut poetry collection from author B.E. Burkhead that shows readers what happens when they take off their rose-colored glasses and look at the world around them. But without further ado, here is the cover to this magnificent collection. Gorgeous right? Artist Steven Archer has created a raw, textured cover to match B.E. Burkhead’s gritty, and unapologetic realism. 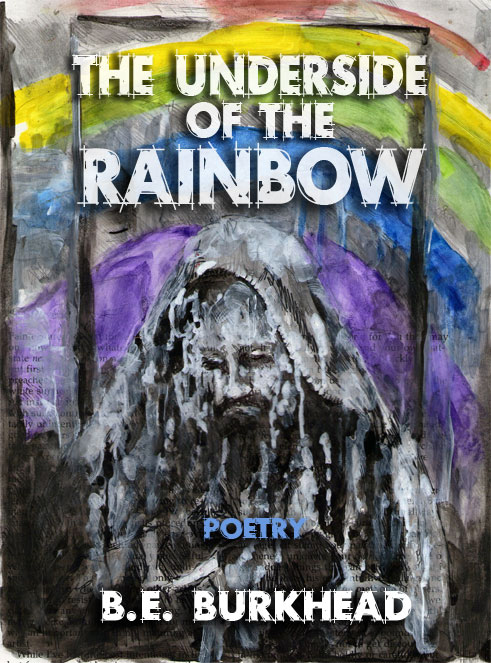 The Underside of the Rainbow comes out next month, but You can pre-order this collection now from Raw Dog Screaming Press. Steven Archer is an artist and musician living in Baltimore, MD. When not recording, DJing, or producing art, he and his wife, author Donna Lynch, tour with their dark electronic rock band Ego Likeness. He has a BFA from the Corcoran School of Art in Washington DC and has shown his work at galleries and other venues throughout the east coast. His work has also been shown internationally in the form of album art and magazine illustrations. He is the author and illustrator of the children’s book Luna Maris. For more information about Ego Likeness, please visit www.egolikeness.com. Steven’s solo electronic project can be found at www.hopefulmachines.net.